Morning Motivation — Are you recreating? 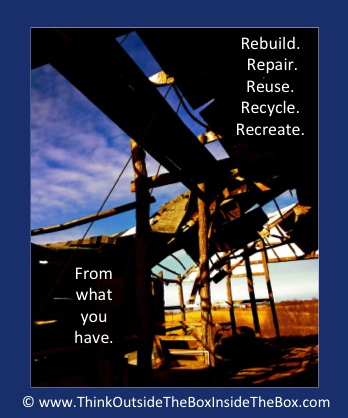 Instead of discarding whatever is broken, whatever is damaged, whatever has crumbled, rebuild it, reuse it, recycle it, recreate it! Don’t waste anything. Just because it’s old doesn’t mean it doesn’t have value. Just because something is broken doesn’t mean it can’t be fixed. Just because something is damaged doesn’t mean it can’t be repaired. Creating from what you have means you have to get creative with what you have. Be re-creative! Whatever you have—whether it’s sparkly, dull, young, aging, boring, exciting, energetic, lackluster—you can create something from it. Recreate what you have into a new creation.